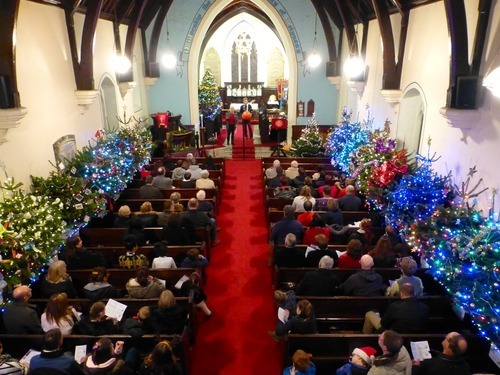 After the Christmas Tree Festival, at 4.00 p.m. on Sunday 14th December, it was the turn of St. Mark’s Church to have their Carol Service which turned out to be a lovely experience by the light of the Christmas trees. 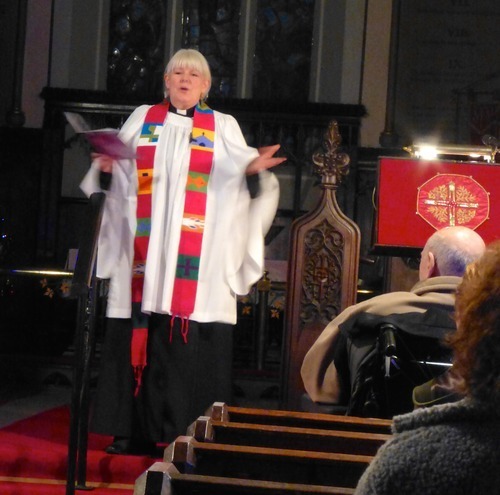 The service was lead by Rev. Eileen who was unwilling to be outdone by Andy’s riddles! “A little boy opened the big and old family Bible with fascination, and looked at the old pages as he turned them. Suddenly, something fell out of the Bible, and he picked it up and looked at it closely. It was an old leaf from a tree that had been pressed in between the pages. At some points Eileen hadn’t found a suitable joke. So, she adopted Andy’s “I’ll give you a clue” approach when announcing some of the carols. This proved to be more comedic than challenging, as the numbers of the carols were up on the board, so most people knew what the carol was before the clue had even been given!!! For me the cutest joke was the last one, which Eileen told after the final lesson, John 1:1-14, Jesus is the word made Flesh. Eileen said, “When asked who was Jesus, Jay, five, replied, “Jesus was a king and he wore a crown even though he was a baby. It was a really small crown””. I understand that The Good Shepherd Mission was full, on the morning of the 15th and the evening of the 16th of December, as parents and family came along to watch the school concert of the pupils of Pinfold School. Every child in the school took part and lots of laughter singing and education took place as the pupils brought to us the history of the Romans. Also, if you looked carefully, you could see a couple of tears of pride by family members as they watched their little ones. And proud they should be as the cast reminded us of “What the Romans did for us”. It was clear that a lot of hard work had been put in by both the staff at the school and all the pupils. The children spoke and sang with confidence as they depicted life in the times of the Romans. Well done Mrs Gillison and everybody at Pinfold School – a brilliant production! Normal services resumed on the Sunday 21st December and then Christmas Eve was another busy day. 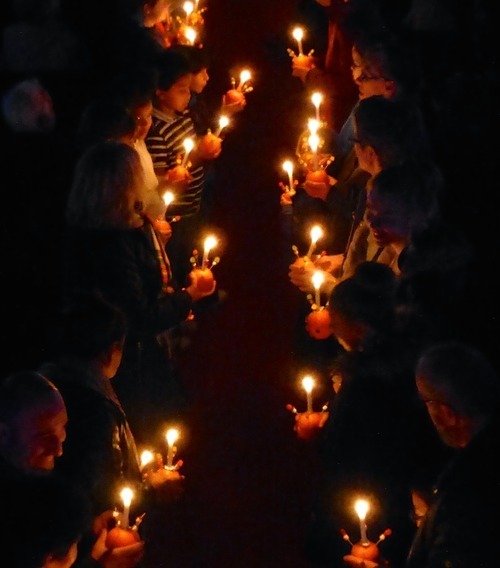 The explanations of the various elements of the Christingle were supported by Biblical references. We then lit each other’s candle as Eileen passed the flame from the Easter candle. 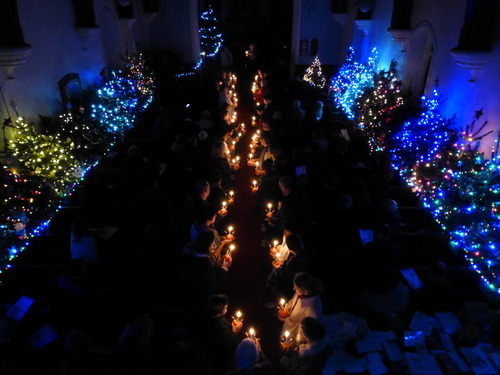 When all were safely in place, the main lights were switched off and we sang Away in a Manger by the light of the trees and the candles. It was beautiful and brought a lump to my throat! Many were up bright and early at the Good Shepherd to share Christmas Communion. The service began by the pulling of a big cracker! Max Jones and David who was visiting told some of the jokes in the cracker. We are not going to pass them on as Andy might want to update his joke book with them!